SQLPLUSW.EXE – The king is dead, long live the king! Hands down, an old “GUI” version of Oracle SQL*Plus (sqlplusw.exe) which was available only on Windows, was always a bit awkward to use compared to a command line version of the same tool. Nevertheless, it was GUI version of the SQL*Plus that I was using most often for ad hoc access to database. Despite of obvious shortcomings in the area of command line history and editing, it felt familiar environment to many developers and DBA’s and now that it’s gone forever with the release of Oracle 11g, I thought I would prepare a “replacement” that will somehow visually resemble old tool but also bring some goodies not available in sqlplusw.exe. 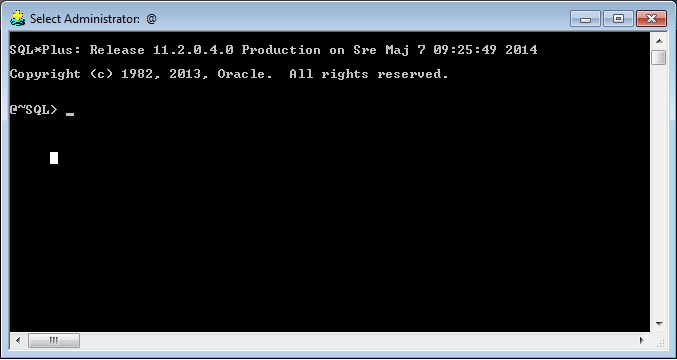 By default we have a boring sqlplus command prompt window. Let’s change some properties, open context menu of the window, then “Properties”. 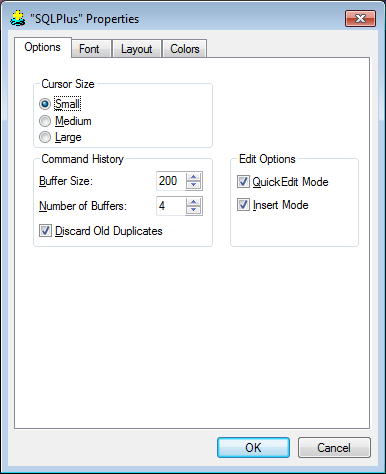 Make sure both “Quick Edit Mode” and “Insert mode” are checked, also increase “Buffer Size” size from 50 to something bigger, like 200. 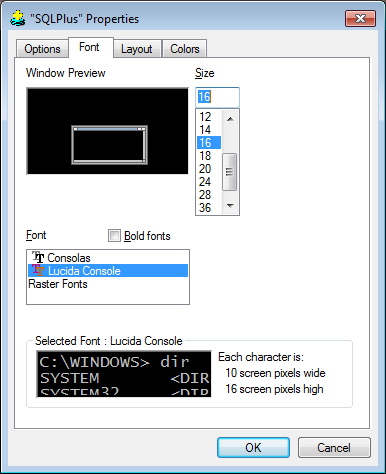 On the next tab select font of your choice, my favorite font is “Lucida Console”, size 16. 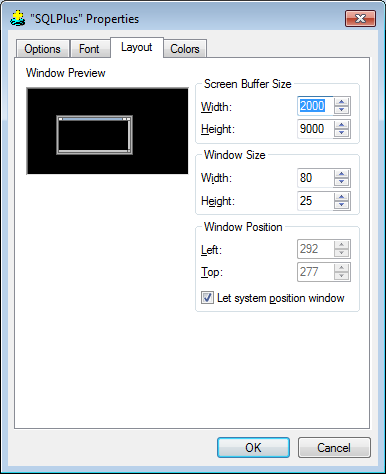 On the “Layout” tab increase “Screen Buffer Size” and if you don’t like 80 x 25 character sized default window, change the proportion to something else. 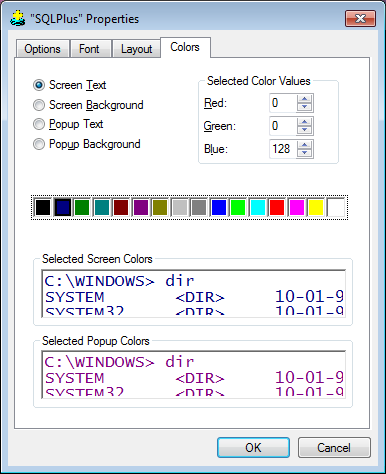 On the “Colors” tab pick a color of your choice, since I want to achieve the look of old GUI sqlplusw I changed background to white and treated myself with a blue color for text, something I could not do in GUI variant. This script will properly set both sqlplus prompt as well as title of the command line window to reflect user and db to which we’re connected. Even if command prompt is in minimized state on taskbar, we can easily determine to which database we’re connected by hovering mouse pointer over the icon. And finally, I would again like to warn about properly setting up NLS_LANG environment variable (in my case to MS DOS Latin 2 codepage), otherwise you’ll end up with data corruption due to incorrect code page conversion between the client and server. That’s pretty much all. One thing that you must be extra careful about is when you just want to use sqlplus to run some script written in Notepad/Notepad++ (written likely in cp1250 in CE region) in which case you should run sqlplus.exe with EE8MSWIN1250 settings. The instructions above are targeted to interactive ad-hoc querying. F8 allows you to search command line buffer. For example start writing your query, then press F8 and cmd will try to pull the line from the buffer. Posted on 20.05.2014, in MS Windows, Oracle and tagged oracle. Bookmark the permalink. Comments Off on SQLPLUSW.EXE – The king is dead, long live the king!.